Looking to take his popular online comedy video podcast “to the next level,” Tim Street, Creator and Executive Producer of French Maid TV has signed with United Talent Agency. ‚ÄúSeeing what UTA has done for Ask A Ninja, Ze Frank and Sam Has Seven Friends‚Äô Big Fantastic I couldn‚Äôt see signing anywhere else. 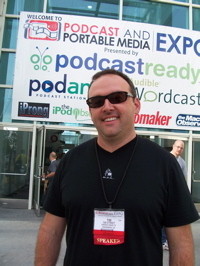 These guys understand the new media space and how it relates to traditional media.‚Äù Street (pictured, right, at the 2006 Podcast and Portable Media Expo) says. Street believes that UTA will be able to help him develop new relationships for integrated advertising in future French Maid TV episodes as well as open doors for him in developing new online content and traditional entertainment. French Maid TV is a popular online video of sponsored, short ‚ÄúHow To‚Äôs‚Äù tutorials, wherein French Maids take products and services that appeal to young men and give step-by-step instructions on how to use them. French Maid TV has had over 13 million downloads with episodes ranging from ‚ÄúHow to Register a Domain‚Äù sponsored by GoDaddy.com to ‚ÄúHow To Find Music You Like‚Äù sponsored by iLike.com. It is part of the mystique, I think. We bask in his coolness whenever we can, and hope that we will by cool-by-association.